NOTE: I wrote on this exact topic last week in my Daily Caller op-ed “Trump’s Offer to Reduce Nuclear Forces: Betrayal or Brilliant?” But here, George Friedman delves deeper into the question Donald Trump has raised about NATO’s obsolescence, specifically through the lens of geopolitical analysis. What he finds is that Europe needs America a lot more than we need Europe. The basic structure of NATO did not change in 1991. What happened was an expansion to include the former Soviet satellite states and the Baltic states. Little military consideration was given to that expansion. Europe no longer faced a military threat. The motive behind the expansion was to bring these countries into the framework of the Western defense system to give them confidence in their independence and help support the development of democracies on the Continent. The motivation was roughly the same as for expanding the EU. The bloc was primarily an economic entity. It expanded its membership without serious thought to its economic mission. Simply being an EU member was believed to enhance prosperity, so that even the economically weakest countries would become robust after attaining membership. The real motive was to expand the EU as far as possible, to integrate as much of Europe as possible into the political and social culture that the union guaranteed. As with NATO, EU expansion had less to do with the EU’s primary mission than with political and ideological factors. The EU question is ultimately a European problem. The U.S. can’t save it, and it won’t collapse because of American opinion. Here, the Europeans must take responsibility for what happens. But NATO is the North Atlantic Treaty Organization. It includes Canada and the United States. It is an alliance, and the U.S. has important and legitimate interests. For 25 years, the fundamental question regarding NATO was not raised in polite company – that is, in the company of NATO countries’ leadership. That question, from the American point of view, divides into three parts. First, with the Soviet Union gone, what is NATO’s purpose? Second, how does NATO serve the American national interest? 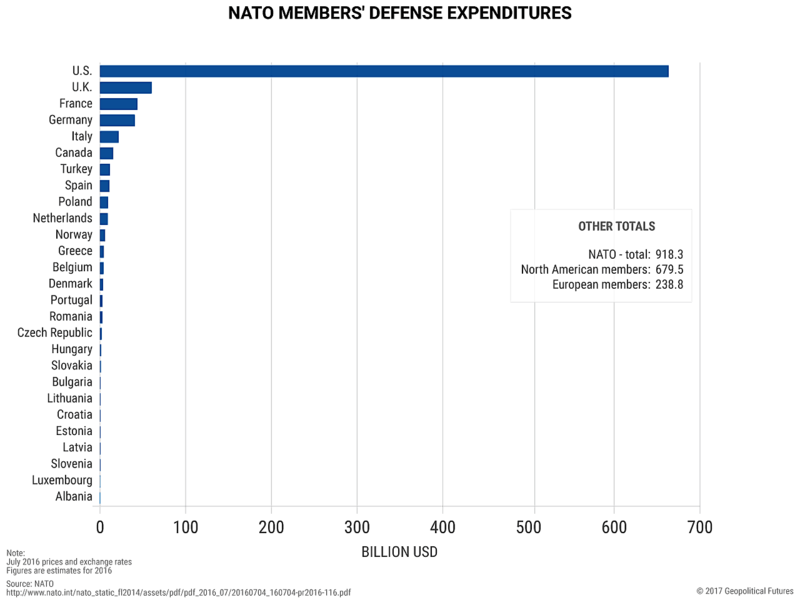 Third, given the fact that the EU has almost as large a GDP and almost 200 million more people than the U.S., why isn’t Europe’s collective contribution to NATO’s military capability larger than the U.S.’? By contribution, I don’t simply mean money, but a suitably large, trained and equipped force able to support the wars that are being fought now. The automatic answer to the first question is that NATO’s purpose is to guarantee its members’ security. On the second question, it can’t be argued that NATO has served American interests since 1991. For the last 15 years, the U.S. has been engaged in wars in Afghanistan, Iraq and other Muslim countries. Whether wise or not, these wars have been waged to different degrees under both Republican and Democratic administrations. NATO is a military alliance and one of its members, the United States, has been involved in wars for 15 years. NATO as an institution has not devoted anywhere near the military force it could afford to any of these wars. It is true that NATO’s area of responsibility is focused on Europe, and the U.S.’ current wars are outside of this area. But from the American point of view, maintaining an alliance with a region where large-scale warfare is unlikely makes little sense. The place where the U.S. needs a large commitment from allies is outside of Europe. NATO must evolve with the needs of its members, and if it can’t, it can be seen (as Trump put it) as obsolete, an alliance created to fight a war that will not happen, and unable to fight a war that has happened. It is certainly true that NATO committed itself to fighting in Afghanistan. Many countries sent contingents. Some, like the Germans, were not permitted to engage in offensive operations, others were too small to be anything more than symbolic. Everything taken together was insufficient to affect the strategic balance on the battlefield. They were there in spirit, but wars are fought with large numbers of troops and equipment. This brings us to the third question – the size of the European force. A military alliance requires a military, and many European countries, in times of prosperity as well as constraint, have chosen not to create a force large enough to support American interests. Their unwillingness to do so has created a reality, which is that even when NATO commits to fighting alongside the Americans, European capabilities limit their contribution to the margins. NATO chose not to support the American invasion of Iraq in 2003. This may well have been wise on its part. But the reality was the following. The U.S. was attacked on 9/11. The initial response was in Afghanistan. The U.S. chose to carry out a follow-on action, in the same conflict, in Iraq. The NATO alliance refused to commit itself to this. Some members fought alongside the U.S., particularly Britain, along with some smaller countries. But France and Germany refused. This was their right as sovereign states. But in exercising that right, they radically reshaped their relationship with the U.S. They would participate in a U.S.-led war if it was in their self-interests. The U.S. could not assume it would receive their automatic support. In that case, the question is what does an alliance with France, Germany and others mean? The issue is not what NATO’s charter says. That charter is obsolete and must evolve to account for new conditions. The issue also is not whether the U.S. was starting a new war in Iraq or continuing the one that began in Afghanistan. The diplomats can argue that as they wish. The issue is that the U.S. was engaged in wars for 15 years, and there was no automatic support from NATO or major European countries in those wars. The countries that wanted to participate fought, with as much or as little as they chose to send. Those that wanted to fight in one war and not the other did. And those that didn’t want to get involved in any wars or arranged to be unable to engage, fought in neither. Nations have the right and obligation to carry out their foreign and military policies as they wish. But an alliance constrains nations to behave in a certain way given certain events. An alliance is a pooling of sovereignty. It is absolutely true that NATO wasn’t conceived to fight wars outside of Europe. Nor was it conceived as an organization where the primary military burden falls on the Europeans. But Europeans must face two facts. First, this is 2017, and the wars that matter to the U.S. are being fought in the Islamic world. Second, this is not 1955, and Europe is not struggling to recover from World War II. It is a wealthy region, and its military capabilities should be equal to those of the U.S. There is a long argument to be had about the wisdom of U.S. policy in the Middle East. It may well be that those countries that limited their involvement in those wars made a wise choice. But that also means that there is no alliance in any practical sense. The U.S. was at war in two countries with multidivisional forces. Each NATO country sent what it chose to Afghanistan. Many chose not to go to Iraq. This was not an alliance action, but individual European countries making the decisions that best suited them. That cannot be criticized, but this does not constitute an alliance. NATO is obsolete if it defines its responsibility primarily to repel a Russian invasion, especially since it refused to create a military force capable of doing that. It is obsolete in that its original mission is gone. It is obsolete in that it regards the U.S. as the guarantor of Europe’s security, when Europe is quite capable of incurring the cost of self-defense. If European nations are free to follow their own interests, then so is the United States. When we step back from the argument between the U.S. and Europe on NATO, we see a broader reality. First, the European Union is fragmenting and that fragmentation necessarily affects NATO. Europe is in no position to undertake unanimously supported NATO operations. Nor is it in a position to incur the political costs of a massive military buildup. For the Europeans, NATO is important because it guarantees that, in the extraordinary circumstance of a European war, the U.S. is, under treaty, required to be there. The United States has other interests. It is interested in preventing Russian hegemony over the European Peninsula, but the U.S. can effectively address that by placing limited forces in the Baltics, Poland and Romania. Just as the Europeans have devolved NATO into bilateral relations between the U.S. and each NATO member, the United States can do the same. Similarly, the U.S. can accept the status quo in Ukraine, written or unwritten. Kiev has a pro-Western government, the east is a de facto autonomous region, and the rights of ethnic Russians in Sevastopol are guaranteed by the Russians. The U.S. is not going to war in Ukraine, and Russia is not going to war there, either. Trump’s approach to NATO has been forced on the U.S. by the Europeans and would be on the table with a different president. NATO doesn’t function as an alliance. It is a group of sovereign nations that will respond to American requests as they see fit. The U.S. understands this, and inevitably, the veil of good manners was going to be torn away. Someone was going to point out that NATO is obsolete. Trump happened to enjoy saying it. But whether it is a tragedy or comedy, the matter can be summed up the following way. The Europeans are wondering if the U.S. will leave NATO. The U.S. is wondering if the Europeans will join NATO. Forgetting NATO, the question is this. What is the commitment of European countries to the United States, and what is the American commitment to Europe? It is not clear that there is a geopolitical basis for this commitment any longer. Interests have diverged, NATO is not suited to the realities of today, and the U.S.’ relations with European states differ from nation to nation, as do European nations’ relations to the United States. — NATO and the United States originally appeared at Geopolitical Futures.